It seems like when Fall rolls around, everything gets even more busy than usual. School starts and that means tons of paperwork, events, school trips and of course homework to make sure everything is checked off the list. Immediately after that the Holidays just seem to happen in a flash. I don't know about you, but this is such a busy time for me and I need to be on top of my game. Keeping my desk organized and ready to function every day is a priority so I don't miss out on the many activities that are scheduled. There are so many fun things I want to do - visit a pumpkin farm - go on a hayride - pick some apples and that is just a few. There's also the family and friends gatherings - Halloween - Thanksgiving - Christmas and then New Years. I need a calendar and desk that can keep track of all this. 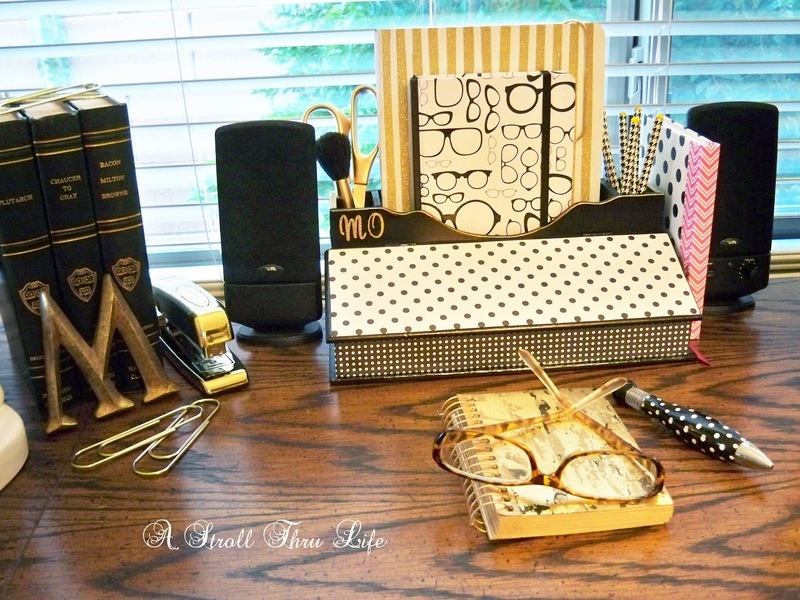 I also want my desk to be a place that I like to be and I want it to be stylish too. In my previous home I didn't have an office space, I used the buffet in the breakfast area. It was a good size and right in the middle of all the action. I could see outside, talk with my hubby and watch what was on the stove all at the same time. Perfect. Now to make it pretty and inviting. Finding unusual desk accessories makes it a lot more interesting. This is a magazine basket that I found at Hobby Lobby a while back and it works great to hold journals and not pads. Having things handy and easily accessed is so important so I can just grab what I need in a second. I love adding flowers too and this orchid is gorgeous. A thrifted clock keeps me in check with my time and a huge paperclip to hold important notes that need immediate attention. Add a few other fun accessories and I am ready to work. 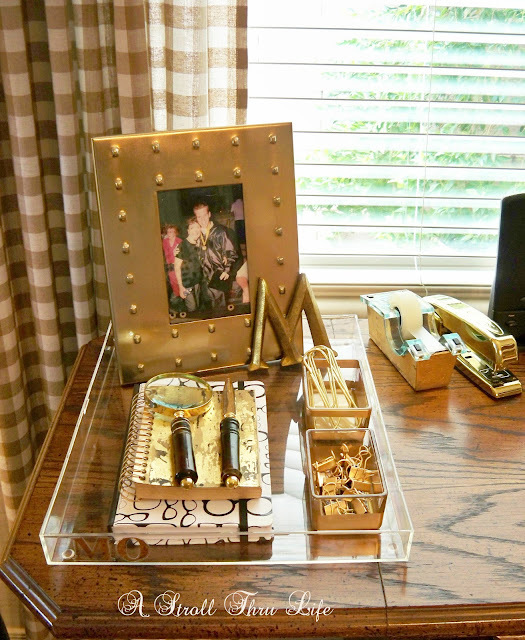 A desk tray is also a handy accessory to have. 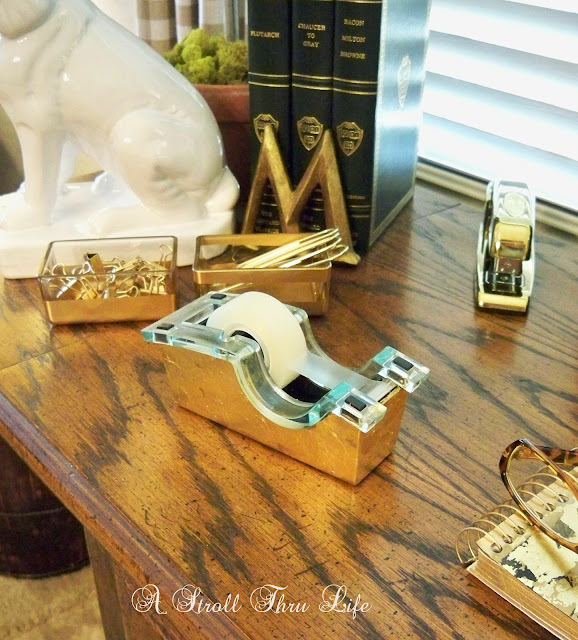 It keeps things organized and keeps your desk area from looking cluttered. I love this DIY acrylic one. This area really did work beautifully for me when we lived there. Now I have a real office space and it is amazing. I use the loft in our upstairs. I call it my Girl/Cave. It is truly a luxury to be able to have such a great space to call my own. I can relax, read a book, watch TV or work on my computer. This little bookcase holds everything I use on a daily basis. The work surface is ample size. Plenty of room for the computer, my coffee cup and my Day Planner. There's still room left over for accessories too. A comfortable desk chair is a must. 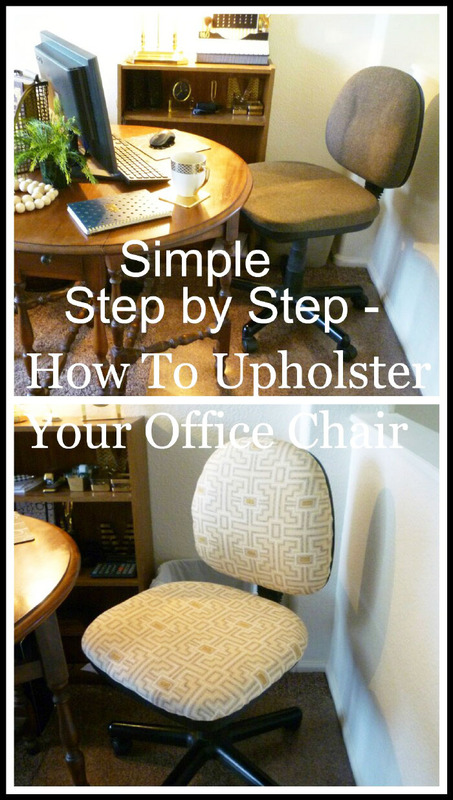 Mine is a Goodwill find that I recovered in a stylish fabric that compliments the rooms decor. It really is a simple DIY . This place works great for me. 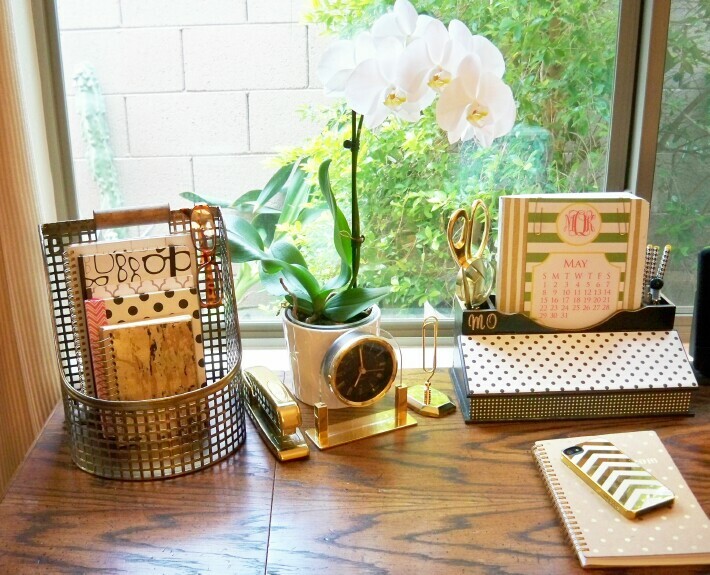 I love being at this little desk area, however you can make any space work for you with just a little thought and a few DIY projects. Think outside the box and make it a pretty place you like to be. Here are a few posts that share some really easy DIY projects to make your desk & office area more functional and a little prettier too. 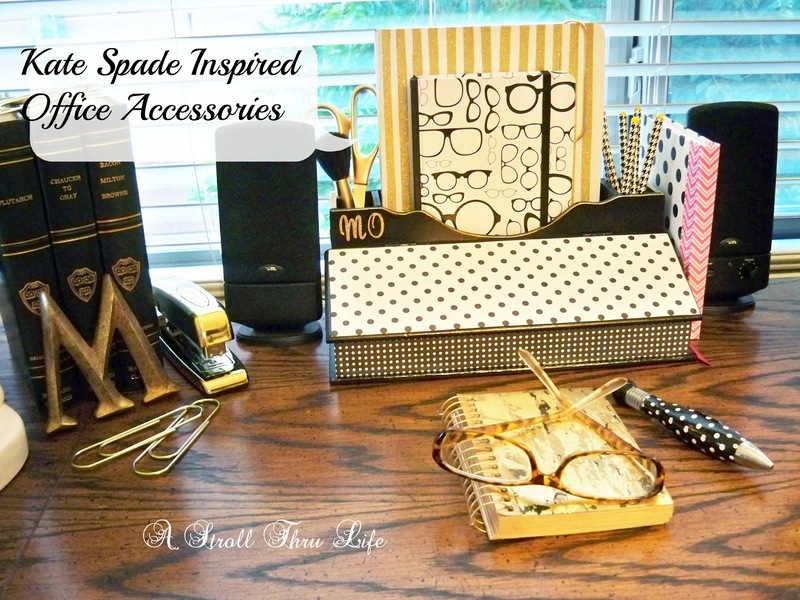 Kate Spade Inspired Office Accessories. Tell me about your office and your favorite accessory. 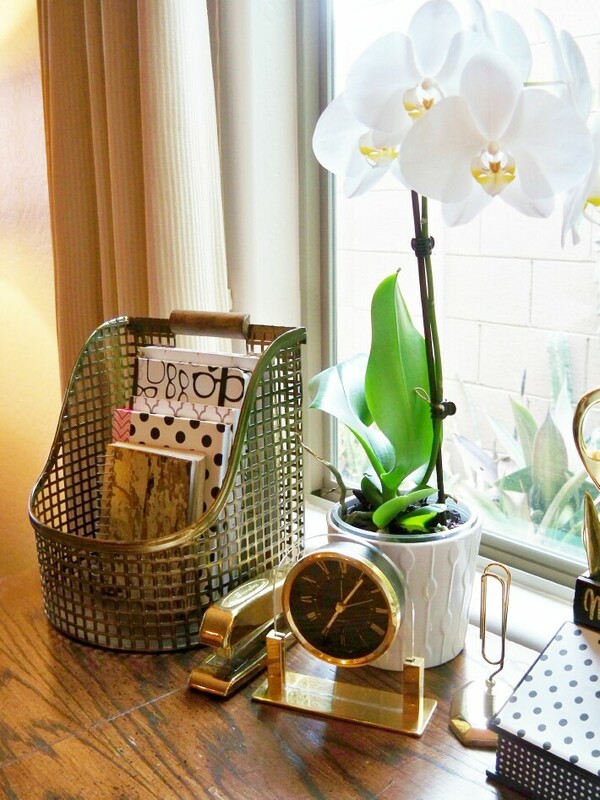 I am always eager to make my space more functional and prettier too. I love your unique desk, it's so creative. A round desk gives you a lot more room. I bet you use it a lot. I have an architect's drawing table as a desk, but it's not used very often. It's not the desk, it's the room. I tend to like using my laptop as I sit on the sofa or in my beloved window seat. Looks great! I too love using unusual things for desk accessories. Keep it interesting, right???? Your old space was great but your new space is fantastic, Marty. I like using things that are not considered "office" things for my personal space, too. Thanks, I fixed the problem. Sorry. I love your new space. I also like to use things that are normally seen in my office decor too. It all looks so great.